Waterbirds, fish and floodplain vegetation species have evolved to withstand highly variable water availability in the northern Basin. They are dependent on a variety of flows to stay healthy and resilient, including floods and natural dry times. The environmental science component of the northern Basin review has improved our understanding of the environmental water needs in the northern rivers and floodplains. We have also further refined our understanding of the social and economic dependences on current water availability. With the aid of hydrological models we assess the effects of different water recovery levels on this triple bottom line, which informs the Authority's decision on how to rebalance water between all users. The MDBA commissioned seven core research projects to improve our understanding of the water needs of ecosystems in the north. From these projects we have a better understanding of the types of river flows that are important for the various life-cycle stages of plants, waterbirds and fish. This includes opportunities for breeding, flowering, germination of plant species, access to habitat for juvenile fish to hide in, or simply the chance for fish to move up and down the river system. The Condamine–Balonne and Barwon–Darling river systems were the focus of these research projects, as these catchments were identified as having a lower information base than the other catchments in the north. Advice from an independent scientific review and consultation with communities and state government representatives helped inform the selection and design of the projects. State-based research agencies have been a partner in many of the projects and conducted much of the on-the-ground fieldwork. This involvement has ensured local knowledge of the river systems helped shape and inform the project outcomes. 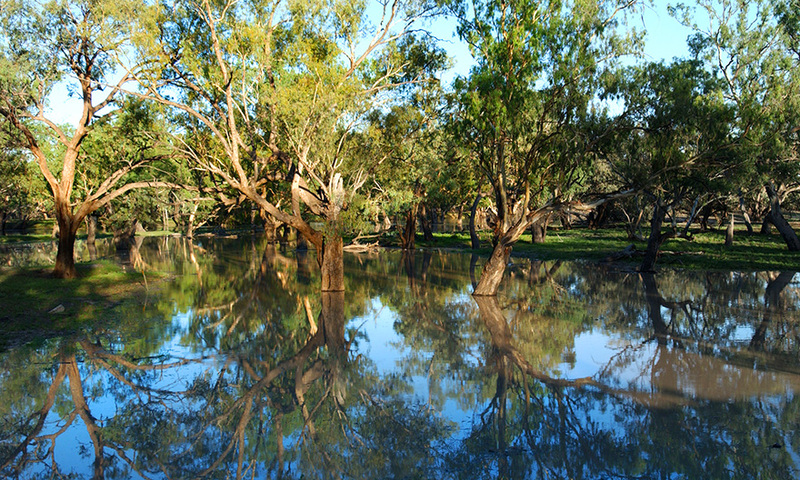 Barwon river near Walgett NSW where Namoi river enters Barwon. Photo by Arthur Mostead. 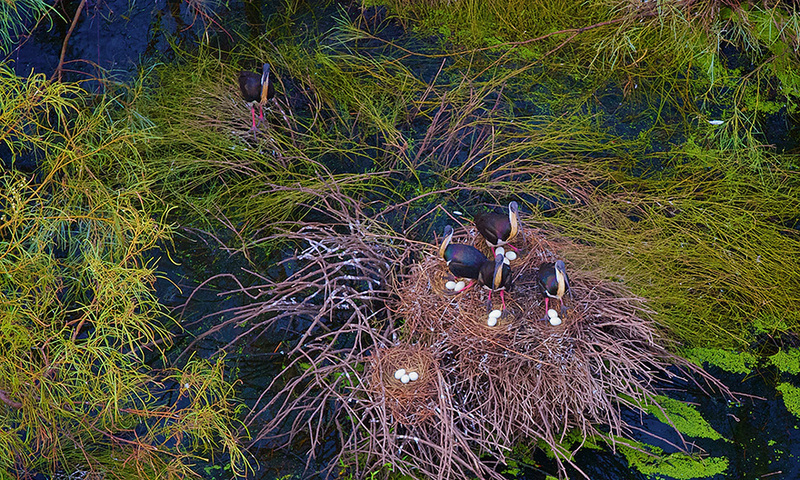 Waterbird lifecycles, such as nesting and breeding, are strongly dependent on the flooding of lakes and filling of wetlands and floodplains. In the Northern Basin, the Narran Lakes wetland system is recognised as a significant site for waterbird breeding, where large populations of the straw-necked ibis can breed along with a host of other waterbird species. The Narran Lakes are internationally recognised and listed as a RAMSAR site of ecological importance. The Narran Lakes waterbird project assessed over 40 years of waterbird breeding data to identify the types of river flows required to lead to large breeding events. From the data, researchers have demonstrated that large flows (flows capable of filling the smaller northern lakes of the Narran Lakes complex) during spring and early summer, lead to large waterbird breeding events at Narran Lakes. 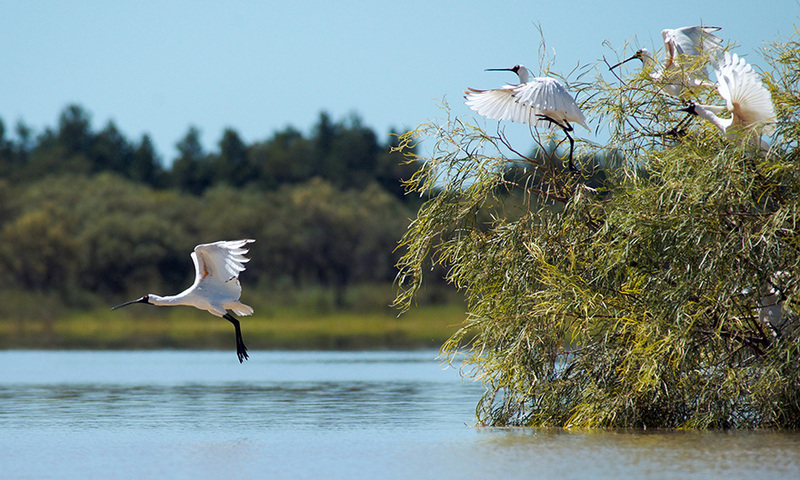 We know however that many waterbirds are migratory and will use wetlands across the Murray–Darling Basin and even outside the basin for breeding. For this reason, we reviewed the scientific knowledge and breeding records for waterbirds at a number of sites within the basin. This waterbird synthesis project has improved our knowledge of habitat needs for waterbirds as well as other important breeding sites (such as Macquarie Marshes and Gwydir wetlands). To build on our understanding of the flow-ecology relationship for waterbirds, we are doing further research into waterbird habitat use in other parts of Eastern Australia. Narran Lakes nature reserve. Photo by Arthur Mostead. In recent years, there has been an increasingly large body of work to understand native and exotic fish populations, and their ecology, in the northern Basin. The fish and flows project brought together 20 fish ecology experts and water managers, from both state governments and universities, to review and collate this body of knowledge. The group assessed more than 150 fish studies, conducted over the past 48 years, to identify the habitat needs of different fish species. The research found that fish species can be grouped based on their preferred habitats. For example, some fish species prefer to live within river channels while others are specialists of floodplains. Others, like the bony bream, are highly adaptable and can thrive in a diversity of habitats. This also applies to the introduced European Carp, which poses challenges for native fish management. In addition to the fish ecology research, the fish and flows project mapped over 1000 km of the Barwon–Darling river. This mapping exercise has specifically identified where habitat features like snags and benches are along the river. With this information we can identify the volumes of water or river flow heights required to submerge these features. Such features not only provide fish with access to food and shelter, they also encourage breeding and movement up and down the river system, and mobilise food sources. Waterholes are significant refuges for fish and other aquatic species, when rivers cease to flow in dry times. To better understand the location and persistence of waterholes we mapped their location in the Barwon–Darling and Condamine–Balonne catchments. In relation to persistence, we undertook fieldwork to identify how long these waterholes retain water and whether they are filling up with sediments over time. This information allows us to better understand how frequently flows are needed to ensure waterholes do not dry out. Aboriginal community members have considered the waterhole project outcomes and provided valuable traditional knowledge about waterholes and rivers. Community members identified key waterholes and their importance as a resource for food, recreation and other cultural needs. Nesting strawnecked ibis on lignum, Lower Gingham. Photo by Joshua Smith. Floodplains are diverse ecosystems that are reliant on overbank flows for parts of their lifecycle and to top-up the water they get from rain or groundwater. Healthy floodplain vegetation supports many animal species, and contributes to the overall functioning of a river system. Over the decades, the amount and extent of floodwater available for vegetation in the northern Basin has dropped, as water has been taken out of rivers for human consumption, development and agriculture. Research on floodplain vegetation seeks to understand how much water floodplain vegetation needs to stay healthy and resilient and how often flooding needs to occur to protect and restore floodplain species. The MDBA commissioned mapping of floodplain vegetation in the New South Wales portions of the Condamine–Balonne floodplain and Barwon–Darling floodplain to get a better understanding of where different plant communities are located on the floodplain. Researchers studied aerial imagery and conducted field surveys at over 1500 locations in the catchments, with many being conducted on private property with the support of landholders. This work complemented similar mapping previously undertaken by the Queensland government. We now have maps covering 16,150 km2 of floodplain, identifying the vegetation communities across this area. Plant experts reviewed the existing research and knowledge on the water needs of key floodplain plant species. In summary findings suggest that floodplain vegetation relies on the natural cycle of wetting and drying to stay healthy. This work helps us identify the types and amount of flow required to restore and maintain floodplains in the Lower Balonne and Barwon–Darling. To assist we need to understand the pattern and scale of inundation floodplain communities have experienced in the past and to identify what level of inundation may need to be restored due to water resource development. Our inundation mapping allows us to understand how much of the floodplain gets wet under different flow rates. Overlaying this with the vegetation maps allows for the identification of the type and amount of vegetation likely to get watered at different flow rates. 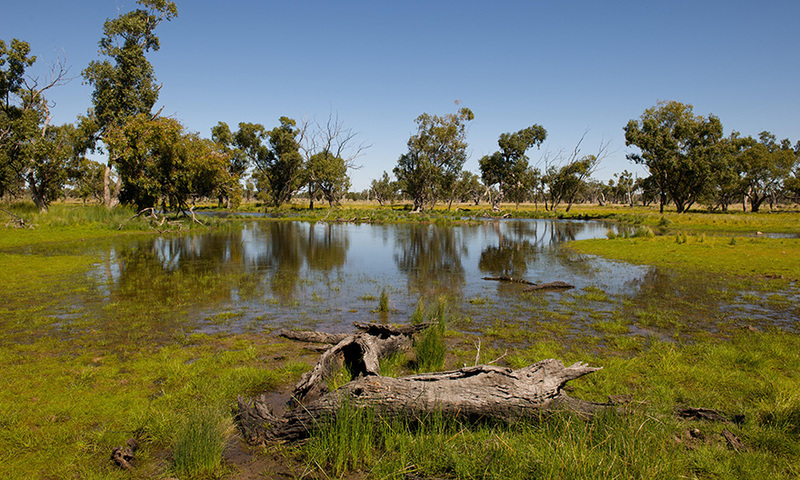 This research helps the MDBA understand how different scenarios of water availability will affect the floodplain vegetation of the Condamine–Balonne and Barwon–Darling. How does water recovery affect flows and environmental outcomes in the northern basin?